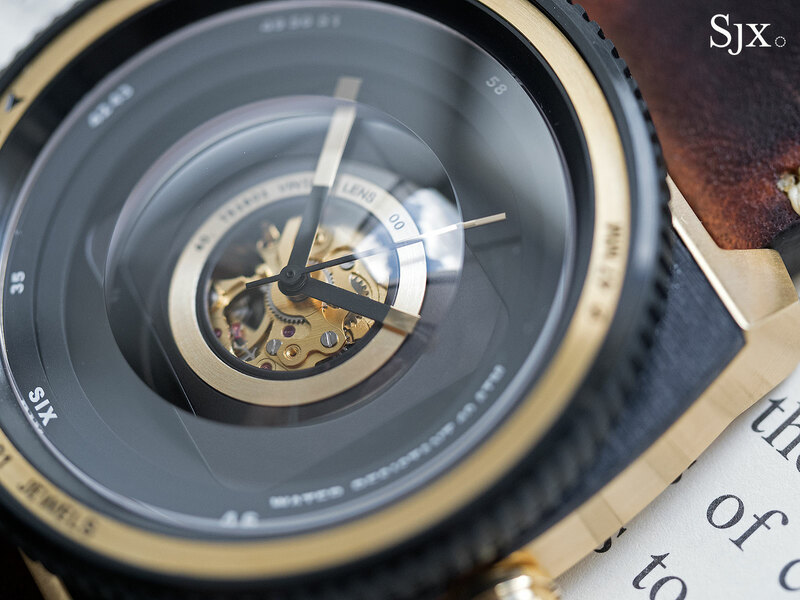 A maker of unusually styled quartz watches that cost under US$200, TACS is the brainchild of Japanese designer Yoshiaki Motegi. TACS’ latest is a modest step up the price spectrum, the Vintage Lens Automatic. 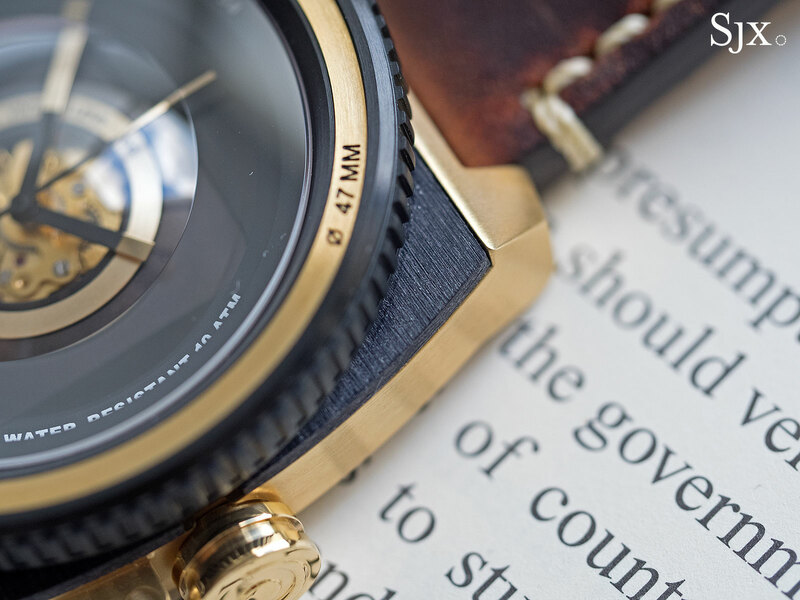 Priced at just over US$400, the Vintage Lens Automatic is a chunky wristwatch modelled on a rangefinder camera – fitted with an impressive fisheye sapphire crystal – and powered by an automatic Miyota movement. Almost kitschy but fortunately not, thanks to well put-together external components, the Vintage Lens Automatic wants to feel like a camera and manages it, especially with the freely rotating bezel that’s akin to a focusing ring. But its best feature is the fisheye lens sapphire crystal that sits over a black dial that ably mimics the look of a camera lens. 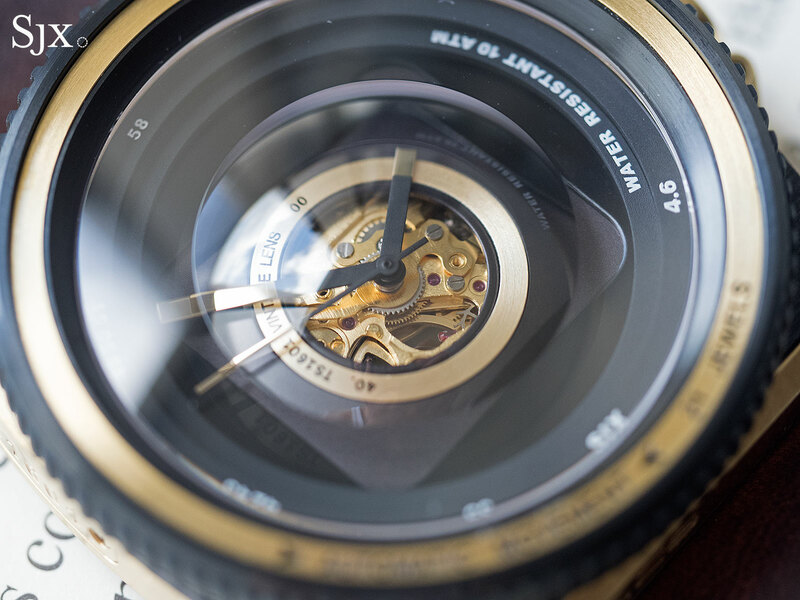 The sapphire crystal is arguably the best technical aspect of the watch, because sapphire crystals on less expensive watches are typically plain and flat since the material is tough to machine, being second only to diamond in hardness. 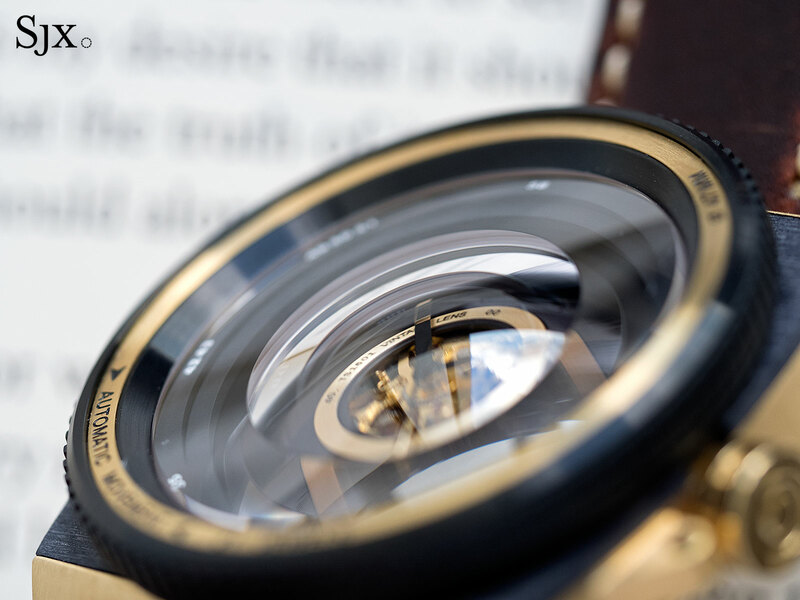 In contrast, the sapphire on the Vintage Lens Automatic is thick enough it sounds dull when you tap it with a fingernail, domed on top and machined out on the underside for the fisheye effect. This feels like it came out of a more expensive watch, especially since fancily shaped crystals are often a selling point on pricier watches. Rectangular in form and painted black in sections to match the dial, the hands are functional but obviously less important. 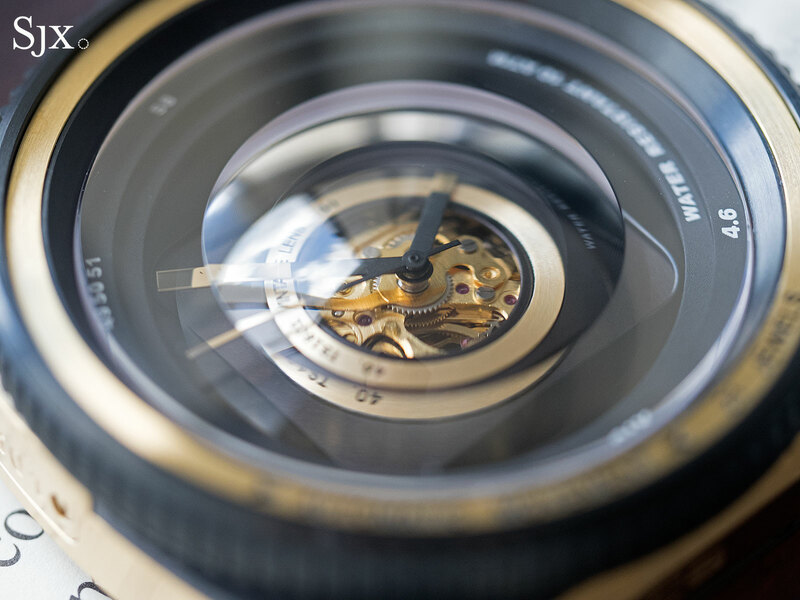 The camera-esque feel is complete by the the dial, which is matte black with a small aperture in the centre. 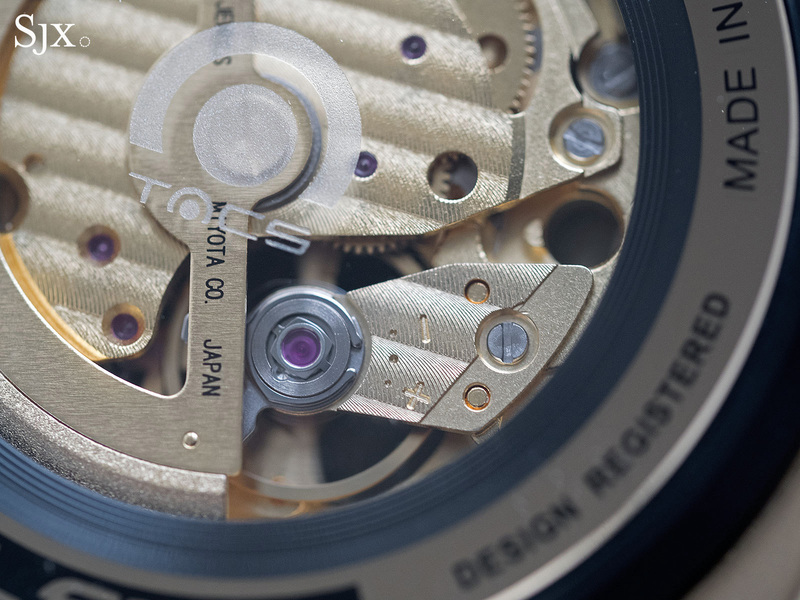 The aperture reveals the Miyota movement, which has a skeletonised main plate on the front. Low cost but robust, the Miyota movement is also visible from the back. 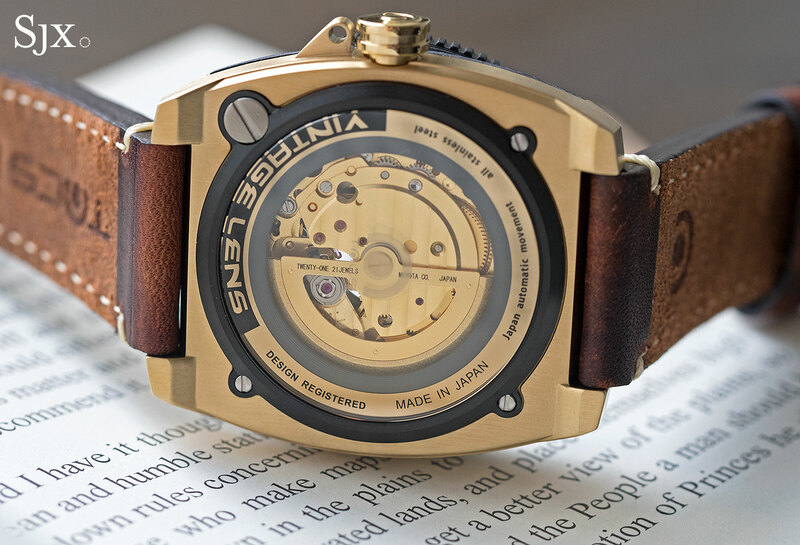 Miyota movements are mass produced by Citizen in China, but effort has been taken to dress this one up, with gilded parts and stamped Geneva stripes for instance. 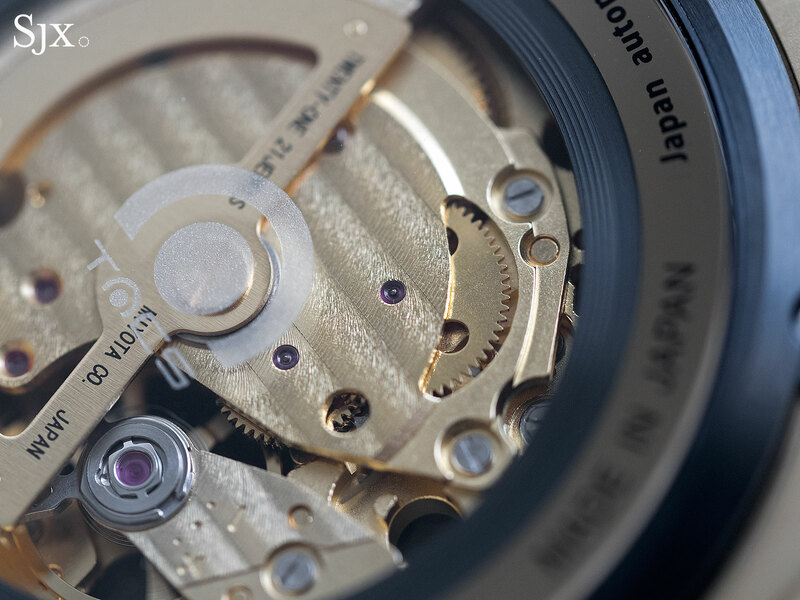 While rudimentary, the movement decoration is more than adequate at this price point, especially since makers of more expensive watches are also resorting to similar styles of finishing to lower prices. The case is large, measuring 47mm wide and 16mm high. Stamped into shape and then brushed, the case is stainless steel, but plated with gold and fitted with a black plastic insert on the front. 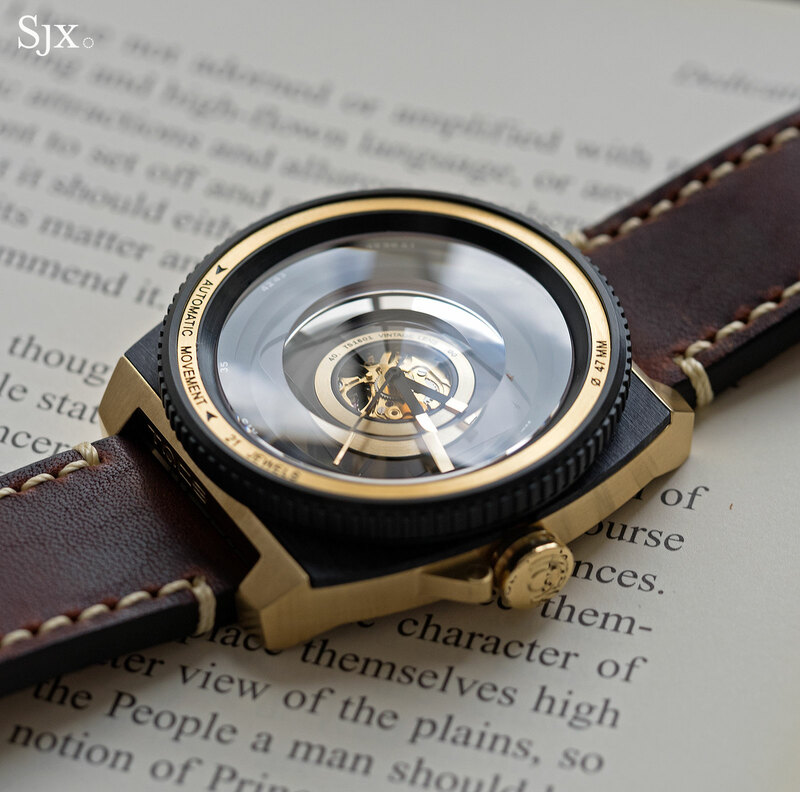 Of all the parts that make up the Vintage Lens Automatic, the case is the one that is clearly of its price bracket. While the look of the case suits the watch, it is heavy, a bit too heavy, almost as if it’s trying to compensate for being affordable. 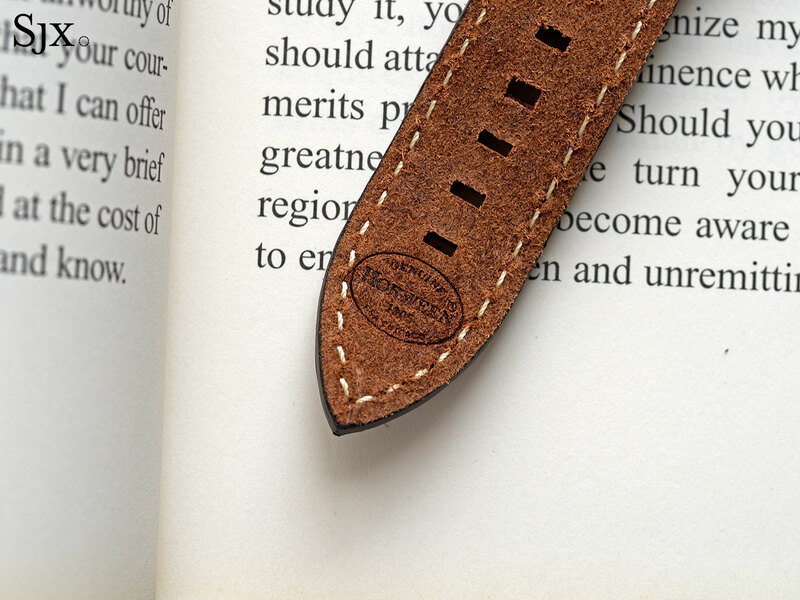 The leather strap is appropriately thick for the watch case, but more notably is made from Horween leather. One of America’s oldest tanneries, Horween is a well reputed leather supplier best known for its shell cordovan, and recently a favourite of sorts for hipster-artisanal leather products. 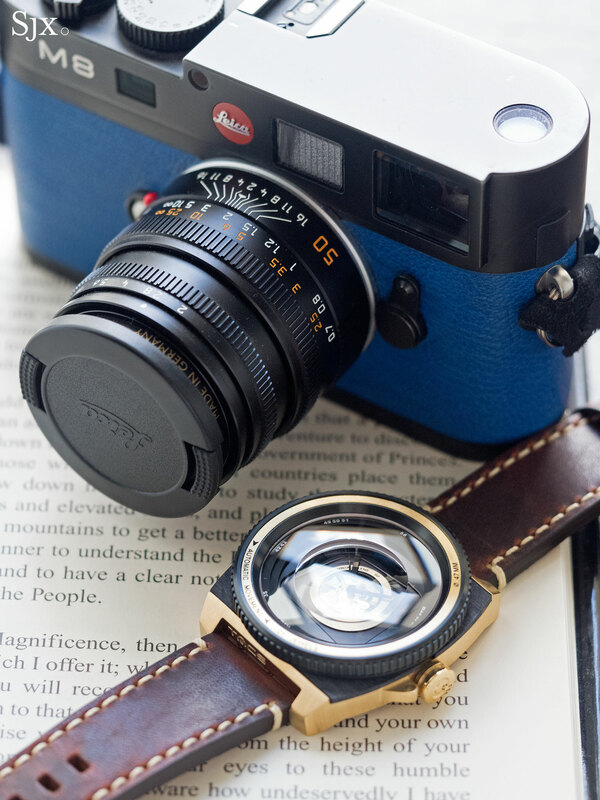 The Vintage Lens Automatic is packaged in a wood box with accessories befitting a camera, namely a leather cover for the watch, and most amusingly, a pouch that holds six SD memory cards. 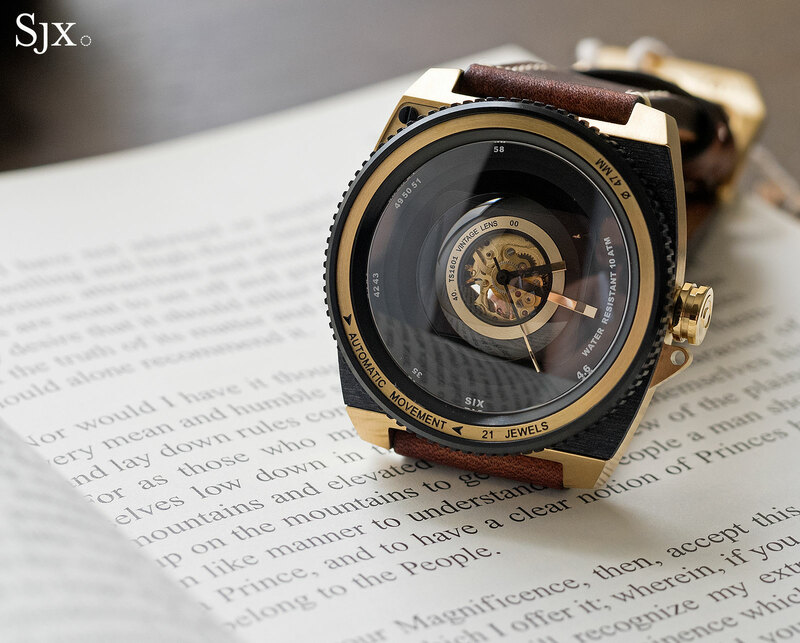 The TACS Vintage Lens Automatic is a limited edition of 500 pieces, available only via crowdfunding site Kickstarter. For the earliest backers it is priced at HK$3299, about US$425, rising to HK$3499 (about US$450) subsequently.